I really enjoy browsing around the breakfast cereals aisle in supermarkets. There's often something new and I'm always on the look-out for healthier options. 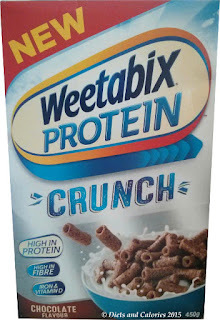 Last week I spotted a new cereal from Weetabix, called Protein Crunch. It's described as a delicious crunchy breakfast that helps keep you going all morning. It also says it's packed with protein and is a satisfying combination of wholegrain wheat and oats. The high sugar content nearly put me off purchasing, and it was only available in chocolate flavour (in this store). However, I was interested to see whether the high protein content made any difference to hunger levels. 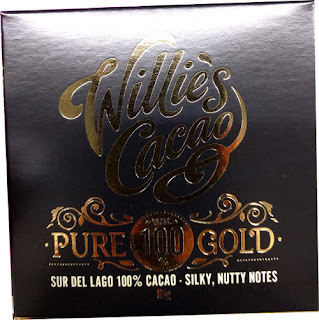 Therefore, I decided to purchase a pack (for review purposes only)! Weetabix Protein Crunch is also available in a plain flavour (without chocolate) and both come in 450g pack sizes. The packaging emphasises the high protein content and also points out that it’s low in salt, high in fibre and is fortified with Iron and vitamin D. What it doesn't mention is the HIGH sugar! 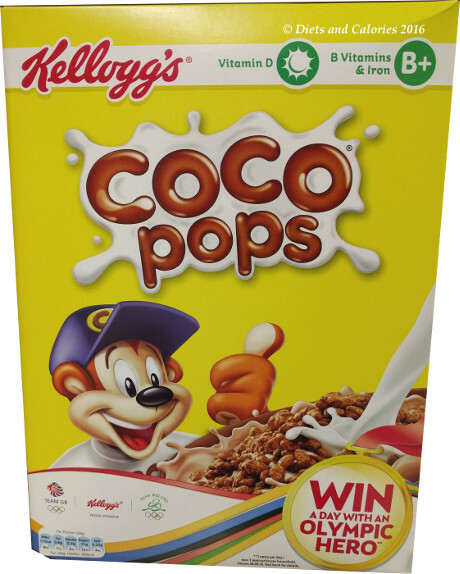 I'm surprised that new cereals being introduced these days are still being made with such high levels of sugar, considering how much bad publicity abounds. So what is the cereal like? 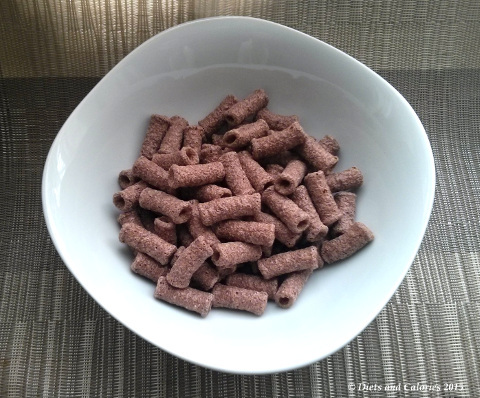 Weetabix Protein Crunch is made from wheat and oats and shaped into little tubes. It’s obviously designed to appeal to children and maybe those who feel they need more protein in their diet. They have around twice as much protein (20g) than other varieties of Weetabix which have around 10g per 100g of cereal. The extra protein content comes from the addition of wheat gluten. Gluten is a protein found in wheat. I ate a few dry just to see what they tasted like. They’re crunchy and sweet have some kind of chocolate flavour, but not one I particularly like. However, my youngest was overjoyed to see I’d bought these and she couldn’t wait to get stuck in. She served hers with regular semi skimmed dairy milk. Asking what she thought, she said 'yummy'. Well, she would say that wouldn't she! It's cereal, it's chocolatey and it's sugary. It's what kids love. She said they went soft and chewy in the milk and gave the milk a chocolate flavour. But the important question – did she feel fuller than normal? No, apparently. Well, on second thoughts, she said maybe a tiny bit. But she's always hungry anyway. 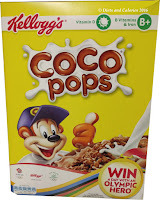 My elder daughter also chose these in preference to the healthier boxes of cereal in our cupboard. So, asking the same question to her, did she feel any fuller afterwards? The answer was no, even though I did wait half an hour after she'd eaten to give her stomach time to register what she'd eaten. The problem is, I don't know how in touch with actual hunger my kids are! In common with many children these days, the minute they feel the tiniest bit hungry, they raid the fridge, so they're never truly hungry. I'm sure lots of people will be interested in Weetabix protein crunch because they're new and look like they might be offering some additional nutritional benefit with the protein. However, if you're after more protein in your diet, there are far healthier ways of getting it (meat, fish, dairy, eggs, pulses, beans, nuts, tofu etc) than a sugar laden cereal. Weetabix are a dominant force in the cereal market and original Weetabix are low in sugar. It’s unfortunate that the majority of offshoots (Crispy Minis etc) are all high in sugar. 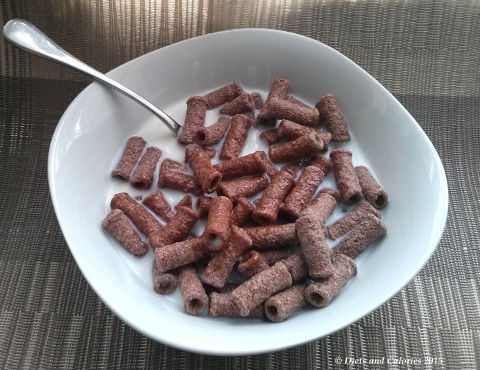 See post: how healthy are your Weetabix? I purchased this pack of Weetabix Protein Crunch in a branch of Morrisons, but they are available in most of the larger supermarket chains. Nutrition information per 100g: (Chocolate Flavour): 379 calories, 3.2g fat, 1.0g saturates, 64g carbohydrates, 22g sugars,20g protein, 7.0g fibre, 0.28g salt.